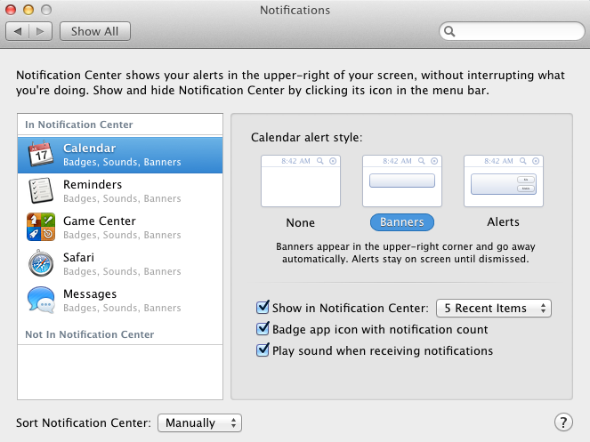 On Mountain Lion, I don't get email notifications in Notification Center when Mail.app isn't running. This is not the expected behaviour (it is inconsistent with the Mail.app behaviour on iOS) and makes the notification feature redundant (Mail.app shows a new email badge and also has an email-snippet view). Is there a setting or third-party solution to fix this? When I'm interacting with email I want to be able to command+tab. This is very handy when composing a message that consists of copy-pasted content from other applications. I also use the "drag a file to the dock icon" functionality to create a e-mail with an attachment. But when I'm not interacting with email (98% of the time) I don't wan't Mail.app cluttering the application-switcher but do want to be notified of new email (via either a notification or a badge). I can only say that this is true. Mail.app has to be open to get notifications. A workaround: Open Mail, and close it with the red dot (or command+w). So the blue point under the icon in the Dock is still there. So you have no window open but mail is still getting emails. There is no app or anything there yet to fix this "problem". Unfortunately, there's currently no way to have Mail.app check for mail if it's not running. But it is possible to hide the badge! In System Preferences, open Notifications and select Mail. There, deselect 'Badge app icon with notification count'. No desktop email application can receive email if it isn't running. The iOS Mail app is a different beast to the OSX app. It is always active in the background. I don't see why the OP thinks this is a problem. Just minimise Mail, the dock icon isn't obtrusive. to the inside of the top-level <dict> of the file /Applications/Mail.app/Contents/Info.plist and then relaunching the app has had the effect in the past of making an app "faceless" — no Dock icon, no ⌘tab switching. Not the answer you're looking for? Browse other questions tagged mail.app mountain-lion notification-center . Why don't accepted event invitations through MS Exchange show up in iCal? Why do so many IMAP providers not work properly with Mail.app? Two Email Accounts in Mail.app / Can I disable notifications for one of them?